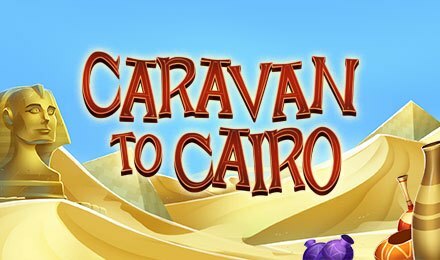 Caravan to Cairo slot is a 5 reels and 243 ways to win slot that comes packed with awesome bonus rounds and features that will have you winning in no time! At Vegas Spins Casino, launch the game and enjoy visiting some of the most ancient monuments that once ruled the lands of Egypt. On the reels, symbols like Alligators, Cobras, Hippos, Goats, Monkeys, Cats, Ducks, Rabbits and Camels come into play to form winning combinations and trigger wins! The aim of Caravan to Cairo slot is to match three or more identical symbols on the reels to trigger a win! Start by first setting your bets on the Bet Field then click on Spin to get the game started. The Autoplay option is also available, which allows you to set a number of auto spins to play. Coin Values: Bet values range from £0.25 to £0.50. The wild takes form of the Pyramid, representing the joker on Caravan to Cairo slot. It replaces all symbols except the scatter symbol. The scatter is the Elephant, which lands on the three middle reels only and triggers the bonus round of the game. Three Elephant symbols anywhere on reels 2, 3 and 4 trigger the Free Games Feature. You’re then given the option to choose to play between 5, 2, 10, 15 or 20 Free Spins which are subject to 10x, 5x, 4x, 3x or 2x multipliers. The feature can be triggered up to 15 times.